New Feature Available: Live Chat With Your Customers! Help your clients find what they're looking for faster. SourceAudio is now proud to offer Live Chat to all sites on the network. 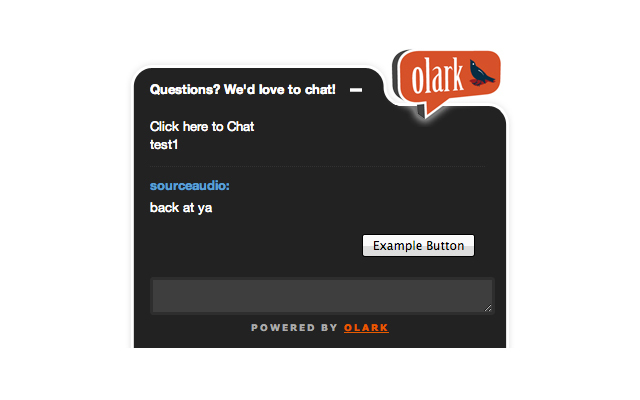 Olark, a leader in online Live Chat services, is now tightly integrated into all SourceAudio sites. With this new chat feature you can see when users are on your site and quickly answer their questions, help them with their searches, or even pitch music to them in real-time. Open up new opportunities and create happy clients by having instant, live access to users who are on your site looking for that perfect track or package for their project. 1. In your Admin Panel, go to the newly added "Add-Ons" section on the left side of your page. In this new section you'll see a tab that says "Chat With Customers" -- click on that tab. 2. Click on the Olark image to sign up for a new account ( or just click here to get started now ) - you will be taken to Olark's site to complete this step. Select your Olark plan, complete your registration process, and then look for your "Site ID" number. You can find your Site ID within your Olark.com account settings. One quick note here: You don't need to copy and paste any code into your site. We have handled that part and all we need is your Site ID and your Live Chat module will instantly appear. 3. Go back to your Live Chat page in the Admin Panel on your SourceAudio site and paste your Site ID number into the Site ID field at the bottom of the page. Click "Finish", refresh the page, and voila, you now have Live Chat enabled on your site! Additional customization and configuration options are available in your Olark.com account settings. Please refer to Olark's site and support team if you have questions about your account, settings, configuration options, customization capabilities etc. Enjoy your new Live Chat feature and stay tuned for more great stuff coming very soon!